In another Friday night rivalry game, the Niagara Falls PowerHawks defeated the Roc City Royals 10-4, after bad weather delayed the start of the game by nearly forty minutes. Andrew Logar led the PowerHawks with six points on the night, while the Minichiello brothers combined for five goals and three assists. Roc City opened the scoring on a defensive breakdown in front of the Niagara Falls net as Jacob Wood put the puck past Kris Augustine at 5:05 of the first period. Nathaniel Nowak provided the lone assist. The lead did not last long as Matthew Minichiello tied the game at 6:01. Stephen Minichiello and Branden Tripi assisted. Andrew Logar gave the PowerHawks the lead at 7:45 of the first, for his 25th goal of the season. Evan Domiano was credited with the primary assist on the play. Frankie Bodami extended the hometown team with a tally at 11:17. Logar assisted on that power play goal. Antonio Lombardo put the puck in the top corner of the net with a sniper shot for the Roc City Royals. Calvin Tonzi assisted. Stephen Minichiello responded 30 seconds later with his first of the night, and 25th of the season. His brother, Matthew, provided the only assist. Nathaniel Nowak finished off the scoring in the first period, with a power play goal for the visiting Royals with only 51 seconds left in that frame. Joseph Inzana and Jacob Wood assisted. After a seven-goal first period, Andrew Logar scored the only goal of the second period. Coming at 7:13, Josh Kalinowski and Evan Korpolinski were credited with the assists. Stephen Minichiello got an early goal in the third period to jumpstart a five goal period for the PowerHawks. Minichiello scored only 44 seconds into the period, assisted by Logar. Minichiello completed the hat trick with a power play marker at 8:31. Branden Tripi assisted. Niagara Falls scored again at 11:48 with Logar assisting. Matthew Minichiello nabbed his second of the night at 13:48 to give Niagara Falls a 9-3 lead. Brother Stephen and Tripi assisted. Calvin Tonzi scored for Roc City on the power play at 14:23 with an assist coming from goalie, Frederick Peters. Andrew Logar completed his own hat trick only 24 seconds later when he froze Peters on an end to end play. Bodami recorded the lone assist. Kris Augustine stopped 14 of 18 shots faced in the win for the PowerHawks. Frederick Peters turned away 45 of 54 shots faced until he was replaced by Kyle Prosperi with just over five minutes left in the game. Prosperi made five saves on six shots. 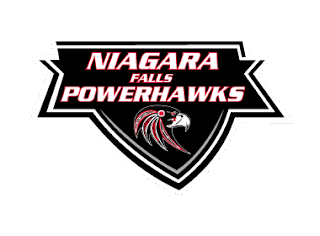 While the Friday night game was the lone game for the Roc City Royals, the PowerHawks will host a pair of games against the Oswego Stampede Saturday and Sunday. Saturday’s game is scheduled for 6pm, and Sunday’s is set to get underway at 1pm.